It’s rich. It’s gorgeous. It’s everywhere! Emerald is taking the fashion realm by storm, popping up on catwalks, red carpets and even the streets. Debuted as the Pantone Color Institute’s 2013 Color of the Year, this deep green hue breathes succulence into each accessory or piece of clothing it adorns—especially eyewear. And David Yurman has definitely taken note of this colorful trend, which is expected to fully perk up come springtime. 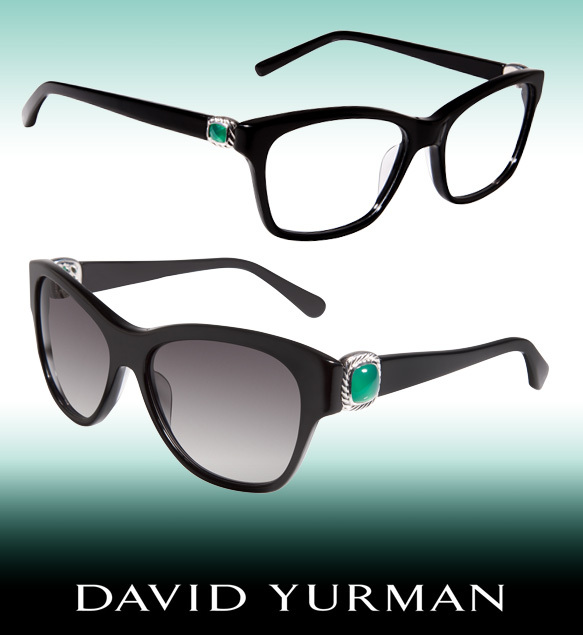 With luscious green onyx stones effortlessly affixed to their temples, these specs and sunnies— exclusively from the David Yurman Albion collection—exude just the right amount of emerald elegance. These eye-catching gems are perfectly showcased against simplistic, jet black frames in feminine wayfarer silhouettes—truly revealing the beauty of emerald.